This Community Needs Assessment presents an overview of the current community conditions for Dunklin, Mississippi, New Madrid, Pemiscot, Scott, and Stoddard county area. Connecting communities to expand, improve and strengthen public health services. 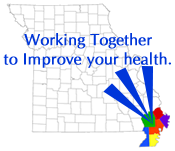 The Bootheel Network for Health Improvement is a multicounty rural health network, established in 2010, with the assistance of a HRSA Rural Health Network Development Planning Grant. The primary purposes of the grant project are to enhance efficiency, expand access, coordinate and improve the quality of essential health care services and strengthen the rural health care system as a whole. This Network has unique insight into the strengths and challenges facing the local health care system and the health status of residents of Dunklin, Mississippi, New Madrid, Pemiscot, Scott, and Stoddard Counties in the area commonly known as the Missouri Bootheel.